Prose and artwork come together to inspire others battling invisible conditions. 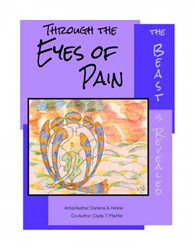 Within the pages of Darlene Hinkle and coauthor Clyde T. Pfeiffer’s new book, Through the Eyes of Pain the Beast Is Revealed, ($15.49, paperback, 9781545600092; $26.49, hardcover, 9781545600108; $7.99, e-book, 9781545600115) readers will find artwork and essays documenting Hinkle’s experience living with chronic pain stemming from fibromyalgia. When words alone could not express her frustration and discomfort, she conveyed her feelings through visual artwork and inspiring prose. Darlene Hinkle is currently a Stephen Minister in the United Methodist church, a volunteer chaplain, and artist. Xulon Press, a division of Salem Media Group, is the world’s largest Christian self-publisher, with more than 12,000 titles published to date. Retailers may order Through the Eyes of Pain the Beast Is Revealed through Ingram Book Company and/or Spring Arbor Book Distributors. The book is available online through xulonpress.com/bookstore, amazon.com, and barnesandnoble.com.